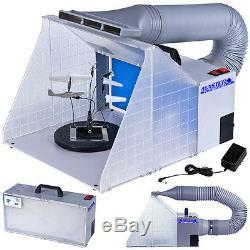 Portable Hobby Airbrush Spray Booth Kit. With Exhaust Extension Hose that Extends up to 5.6 Feet (67 Inches). A Great Booth that's Easy to Set-Up and Use! Keeps your work environment neat and clean by reducing the mess and hazards when spraying in confined areas. The High Volume Fan Extracts Over Spray and Reduces the Fumes from Airbrush and Spray Gun Materials. It's Ideal to use when Spraying Models, Small Parts, Ceramics, Radio Control Models, Etc.. 25 Watts with a 4 Cubic Meters/Minute Fan Extraction Rate. Easily Folds into a Suitcase Shape w/Handle for Carrying or Storing. Flexible Hose that Extends up to 5.6 Feet (67 Inches). To Keep Particles and Vapors away from your Work Environment, Place the 1" High x 9.5" Wide Exhaust Hose Outlet between a Small Window or Door Gap. 2 Layer High Density Fiberglass Booth Filter (Replacement Filters Available). Allows you to Reach all the Areas to be Painted. Clip on Parts Holder Shown on Turntable is Not Included. It's for Display Purpose Only. Surface Protection for your Workbench. Detailed Spray Booth Instruction Manual. So you can be Assured of Quality and Reliability. Not intented for use with Hazardous Materials, Flammable or Explosive Paints or Materials. Operates at 12V DC Using a Direct Plug in 110V AC Adapter. 4 Cubic Meters/Minute Extraction Rate. 16.5" Wide x 19" Deep x 13.5 High. 16.5" Wide x 6" Deep x 8 High. 16" Wide x 7-1/4" High x 7/8 Thick. They can be combined into One Double Sized Spray Booth! Booth also Operates with Optional 12 Volt DC Rechargable Battery and Charger Pack. MASTER AIRBRUSHES, AIRBRUSH SYSTEMS, PARTS & ACCESSORIES, PAINTS, and MORE. MASTER Airbrushes and AirBrushDepot Ccompressor Systems. Airbrush Learning Center - DVD's and Books. We are an authorized dealer for all the product lines we sell. If a listing is for a particular item then that is what you will receive. If you do want to attempt to change an order or make an address change, it is best to call our customer service department immediately. Once you pay your order prints in our warehouse for fulfillment. If you have questions on how to do this, please message us first. INTERNATIONAL ORDERING: All of our electronic items are rated for US voltage 110V. It is the customer's responsibility for knowing the correct voltage requirement of their country. If you select this option at checkout, be advised that if package is lost, stolen, or damaged, no claims can be filed. We do not mark packages as GIFT. We reserve the right to select best option. UPS cannot deliver to P. UPS Ground is used within the lower 48 US States and Canada. We will always make your order right. When contacting us please provide full UPC barcode number and/or Model Number off the wrong item you received to speed up the re-order process. NO reorders will be processed without following our policy information proccedure. Pictures may also be required to process re-order. If this information cannot be provided then claim cannot be processed. In some cases we may not need to file carrier claim. Paint Products and DVD's are excluded from this guarantee. Sellers: Get your own map today. The item "Portable Hobby Airbrush Paint Spray Booth Kit Exhaust Filter Extractor Set Model" is in sale since Monday, April 28, 2014. This item is in the category "Crafts\Art Supplies\Airbrushing". The seller is "tcpglobal" and is located in San Diego, California. This item can be shipped worldwide.